Adnan Januzaj wants to leave Manchester United permanently after being left out of Jose Mourinho's first-team squad. The Belgium forward's contract runs until 2018, and the club have indicated a preference for him to leave on loan. However, Januzaj has been left so disappointed by his treatment, he would prefer a permanent transfer. The 21-year-old has been linked with Sunderland, managed by former United boss David Moyes, while there has also been interest from Spain and Italy. It is understood Januzaj was not given any warning he was going to lose the Red Devils' coveted number 11 shirt, or an explanation as to why he does not figure in Mourinho's short-term plans. The number 11 went to Anthony Martial, with new signing Zlatan Ibrahimovic taking number nine from the Frenchman. Januzaj, who now has number 15, has been instructed to train with United's reserve-team players. His status has fallen rapidly since his performances under Moyes in 2013 earned him a lucrative five-year contract. The Belgian went to Borussia Dortmund on what was supposed to be a season-long loan last season but did not impress and returned to United in January. He made only three substitute appearances, totalling 17 minutes, on his return and it is evident Mourinho has the same reservations as predecessor Louis van Gaal. 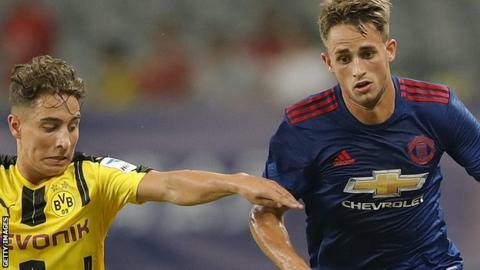 Januzaj did go on United's pre-season tour of China last month but is not among the 23 outfield players Mourinho has picked to work with throughout the season. The player has not made the expected impact at international level either. He was talked of as a potential England player before committing himself to Belgium, but has not added to the six caps he won in 2014, which included playing at the World Cup.